Paul Bocuse (pronounced: [pɔl bokyz]) (born 11 February 1926) is a French chef based in Lyon who is famous for the high quality of his restaurants and his innovative approaches to cuisine. A student of Eugénie Brazier, he is one of the most prominent chefs associated with the nouvelle cuisine, which is less opulent and calorific than the traditional cuisine classique, and stresses the importance of fresh ingredients of the highest quality. Paul Bocuse claimed that Henri Gault first used the term, nouvelle cuisine, to describe food prepared by Bocuse and other top chefs for the maiden flight of the Concorde airliner in 1969. Bocuse’s main restaurant is the luxury restaurant l’Auberge du Pont de Collonges, near Lyon, which has been serving a traditional menu for decades. It is one of a small number of restaurants in France to receive the coveted three-star rating by the Michelin Guide. He also operates a chain of brasseries in Lyon, named Le Nord, l’Est, Le Sud and l’Ouest, each of which specializes in a different aspect of French cuisine. His son, Jérôme, manages the Chefs de France restaurant inside the French pavilion at Walt Disney World’s EPCOT. Bocuse is considered an ambassador of modern French Cuisine. He was honored in 1961 with the title Meilleur Ouvrier de France. He had been apprenticed to Fernand Point, a master of classic French cuisine; and Bocuse dedicated his first book to him. Bocuse has made many contributions to French gastronomy both directly and indirectly, because he has had numerous students, many of whom have become famous chefs themselves. One of his students was Austrian Eckart Witzigmann, one of four Chefs of the Century and the first German-speaking and the third non-French-speaking chef to receive three Michelin stars. Since 1987, the Bocuse d’Or has been regarded as the most prestigious award for chefs in the world (at least when French food is considered), and is sometimes seen as the unofficial world championship for chefs. 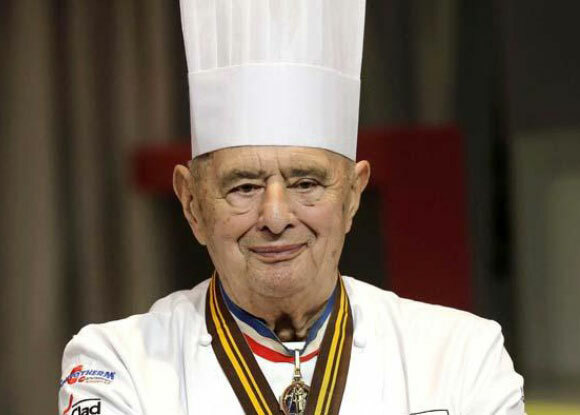 Bocuse has received numerous awards throughout his career, including the medal of Commandeur de la Légion d’honneur. The Culinary Institute of America honored Bocuse in their Leadership Awards Gala on 30 March 2011. He has received the “Chef of the Century” award. On 4 July 2012, in the New York Times the Culinary Institute of America announced they will change the name of their “Escoffier” Restaurant to the “Bocuse” Restaurant, after a year-long renovation. In 1975, he created the world famous soupe aux truffes (truffle soup) for a presidential dinner at the Elysée Palace. Since then, the soup has been served in Bocuse’s restaurant near Lyon as Soupe V.G.E., V.G.E. being the initials of former president of France Valéry Giscard d’Estaing.